Out of all the bunches of flowers in art — and there are a lot of them — how interesting that Van Gogh’s Sunflowers have become the most emblematic and popular. Why not Renoir’s roses? Or Manet’s peonies? Or, looking back further, Bosschaert’s tulips? Why is it that whenever the National Gallery publishes one of its lists of bestselling postcards, the Sunflowers are always on, or near, the top? There won’t be one reason, but several. Popular taste is shaped by an assortment of interconnected influences. Location is certainly one of them. 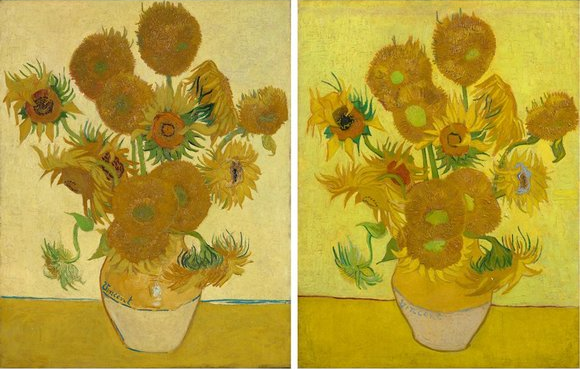 If the National Gallery were in Mongolia or Tajikistan, none of its holdings could have acquired the astonishing familiarity of Van Gogh’s Sunflowers. What’s more, there are several other versions of the picture scattered about the museum world. One in Philadelphia. Another in Tokyo. A third in Munich. In art terms, the Sunflowers image works like a successful franchise. In the end, however, it is surely the power of all that unchained yellow that bowls us over. It’s like having a fireman point his water cannon at you and drench you with a blast of thick, gorgeous, dripping sunshine. What an intense colorific experience it is. Before Van Gogh, yellow had a rather modest history in European painting. Fragonard was good with yellow. So was Gainsborough. And, before them, Zurbaran. And that’s about it. Yet if you look earlier and wider in the story of human creativity — the marvellous Colombian gold show, Beyond El Dorado, at the British Museum until March 23, is a perfect place to start — you will see that yellow was once the colour most closely associated with the energy of existence, with the power of the sun, with life itself. And Van Gogh, to his eternal and momentous credit, intuited all that. Right now, at the Van Gogh Museum, in Amsterdam, the epicentre of Van Gogh scholarship and opinion, a move is afoot to adjust his image. The Amsterdammers are fed up with questions about the absinthe-guzzling madman who cut off his ear, so they’ve set out to reposition Vincent as a more rational and less emotional painter. They would like us to imagine a more reasonable artist. Personally, I doubt their effort will succeed. The Sunflowers will never seem fully reasonable. He actually painted scores of sunflower pictures in his career. The first were done in Paris in 1887. Wandering about the scrubby farmland of Montmartre, he liked the way the huge sunflowers people kept in their gardens leant over the fence and turned their sunny faces to him, like a friendly neighbour. Later, he painted the dried-out seed heads at the end of the summer and gave them the air of a memento mori. When he moved to the south of France, a few months later, painting sunflowers was already an ambition. The National Gallery picture was one of a dozen sunflower paintings he planned originally to hang on the walls of the Yellow House, in Arles, in Gauguin’s bedroom. They were going to be the first thing Gauguin saw when he awoke. “Nothing but large Sunflowers” was how Vincent italicised it to Theo. What a start to the day. All through August 1888, he worked on them from morning till night. And of the first batch of four, the final one was the best. That is the one the National Gallery owns. It bought it in 1924, directly from the artist’s family. The version that is now hanging next to it, borrowed from the Van Gogh Museum, was painted several months later, in January, after his breakdown and the ear-cutting incident. It was intended to be an exact replica. While Gauguin was living with him in Arles, Vincent seems to have promised to give him the best of the sunflowers. But because Gauguin left in a hurry after Vincent attacked him, he couldn’t take the painting with him. So, later, he wrote asking for it. Vincent didn’t want to part with his original, and it was now January, too cold for sunflowers, so he began making a replica, using tracing paper to copy the existing design. That is what the Amsterdam picture is: a stupendous tracing. Look how the colours are even brighter and more zingy. With no actual sunflowers to be found in Arles in January, Vincent had to imagine their presence and their colour. That’s why the Amsterdam version is so intense. It’s a work of the imagination. Many years later, when Gauguin remembered that fateful autumn in Arles from his new home in Tahiti, he described how “in my yellow room, sunflowers with purple eyes stand out on a yellow background, and bathe their stems in a yellow pot on a yellow table”. The “purple eyes” are easier to see in the Amsterdam picture than in the National Gallery one, which must have faded. Who could have imagined that one day a painting would pop up at the National Gallery that made Van Gogh’s Sunflowers look paler? Hah!